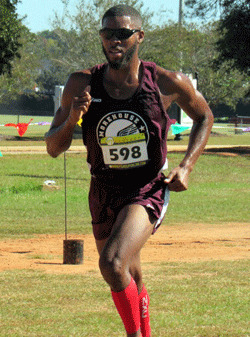 Trey Simons and his Morehouse College Men’s Cross Country teammates dominated the field at the 2018 Willie Laster Cross Country Invitational in Albany, Ga.
Morehouse College won with 20 points, ahead of second place Tuskegee (72), Albany State (76) and Fort Valley State (94 in the five team field. Morehouse College runners took six of the top eight spots led by senior Simons, who won with a time of 25:40.80. Junior Collins Kiplimo was second in a time of 27:29.77, followed by sophomore Randy Carter in fourth stopping the clock in 28:38.51 and junior Qaseem Wajd finished in fifth with a time of 30:06.26. Sophomores Dobbin Bookman finished seventh clocking 30:08.30 and Devin Hawkins finished in eighth in 30:08.47.